You probably have heard about using a silk pillow case to help prevent wrinkles since the smoothness of the silk doesn’t cause impressions over time, in your skin, as traditional cotton pillow cases. So if silk pillow cases are beneficial to your skin, why not silk ON your skin itself? I don’t mean smearing a Hermes silk scarf on your face, but the silk product itself in your skin care regime. That silk pillow case is made of silk so silk can be woven into your moisturizer too. There is scientific ‘evidence’ that the benefits if silk in skincare is due to its anti-aging properties – by protecting the skin from environmental stresses and adding moisture to the skin to assist in collagen production. The best way I can describe it (though not the most glamourous way) is like plastic wrap. When you wrap your bowl of pasta with plastic wrap, you keep the pasta from drying out by keeping the moisture inside, and keep dust and dirt out of the bowl. So the same can be said of silk – bad stuff out and good stuff in. However, not all silk is the same. Just like you should read the ingredients in your pasta, you should read the ingredients in your moisturizer. Many products that say they are silk are, well not, really made with silk – just silk by-products. So when Silk Theraptutics reached out, I wanted to give them a look. Not only because it is a Massachusetts-based company, and they use silk in their skincare, but because they only have five things in its moisturers. Nothing else. I was intrigued. I don’t think I’ve ever come across a skin care product with only five ingredients. The Silk Therapeutics Silk Smoothing Complex has (1) water, (2) silk (not silk powder, hydrolyzed silk or sericin), (3) Vitamin C, (4) Sodium Benzoate and (5) Lemongress essential oil. No GMOs, no paragons, no Phthalates, no petrolatum, silicone, alcohol or extra additives. The sodium benzoate is a preservative (also found naturally in low doses in some fruits) and Lemongrass acts as an astringent, which helps to minimize pores, limit the secretions of oil and provide a temporary skin-firming treatment. The silk gives the moisture and delivers the vitamin C and lemongrass benefits while protecting the skin from the environment. 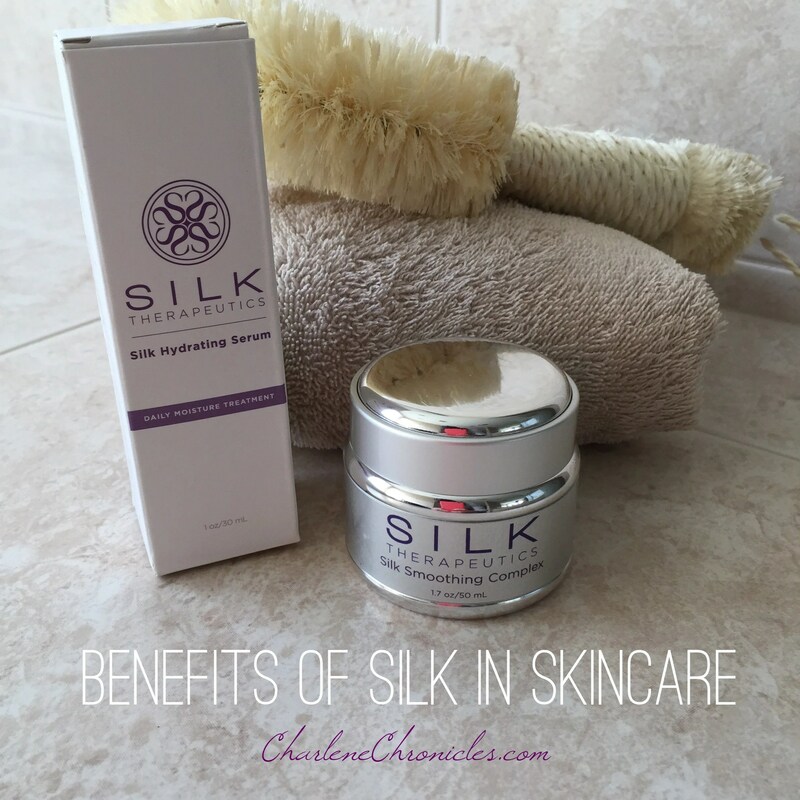 The Silk Smoothing Complex is a great daily moisturizer, but I would definitely also add their Silk Hydrating Serum. I recently went to a event with a skincare expert and a serum is an essential part of a skin care routine. It gives the skin yummy benefits and preps the skin to get even more out of a moisturizer. It’s like finding that special someone. You can live life fully as a single gal or guy, but finding a complimentary partner makes you that much better of a person? Bonus. Just like buying a real silk scarf, buying real silk skincare products is going to cost more than non-silk products. However, while the Silk Smoothing Complex costs $140, you get 150-200 applications from the one jar. Plus, if it makes me look good everyday, I’m not going to be finding ways to substitute. I’d rather get great skin care rather than buy a lot of cosmetics to camouflage my skin. Plus, if I only have to put some mascara on and some lipgloss and cut my morning routine in half because I don’t have to do a lot of skin touch ups, priceless in my book! So, I love the concept of silk, and the ingredient list, the huge range of skincare products from the Silk Therapeutics company, so I’m about to give the moisturizer and serum products a whirl. So check back in a month to see my thoughts on using the products! And let me know what you think about the products if you have tried it before!